The BEST and EASIEST Coffee Cake Recipe! 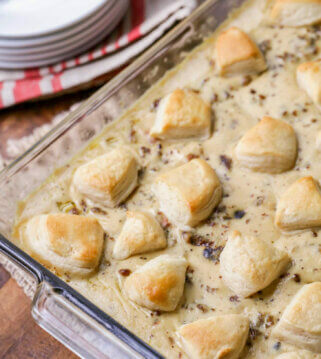 It’s moist, delicious and perfect for showers, breakfast and holiday celebrations! One of my FAVORITE things to make for a breakfast get-together is coffee cake! This next recipe is quick and it is so buttery and cinnamon-y that everyone loves it. My mom first made it for me when I left for a summer camp as a teenager and I remember thinking, “I need to have this recipe in my life!” It was just too good. Since then, I’ve tried a few coffee cake recipes before, but none come close to this one. It’s simple and has become a staple for many holiday morning celebrations. This cake is moist, soft, warm and full of cinnamon and sugar goodness. Why is it called coffee cake when there isn’t coffee in the ingredients? This type of cake has been around for centuries with each country having their own variation. The American versions have a delicious streusel topping and seem to have mainly originated from Germany. No matter the recipe what they all had in common was being served alongside warm cup of coffee. Hence the name Coffee Cake! To make it, begin by mixing the oil, eggs, vanilla and milk together. In a separate bowl, combine the dry ingredients – sugar, flour, baking powder and salt. Combine the wet and dry ingredients and blend until smooth. Set aside. Then you will make your streusel/brown sugar topping by combining the brown sugar and cinnamon. Pour half the batter into a greased 9×13 pan. Sprinkle on half the streusel. Top with remaining batter and then sprinkle on the rest of the streusel. Drizzle with melted margarine/butter. What are some coffee cake add-ins or substitutions? Adding fruit can be a delicious variation. Try blueberries, sliced peaches or sliced apples. The liquid from the fruit may cause the cake to be baked longer. Drizzle a glaze over the top: Make a glaze by mixing ½ c confectioners sugar with 1 tablespoon milk. Mix until smooth and drizzle over cooled cake. How do I store coffee cake? Store in an airtight container at room temperature for up to 2 days. Wrap tightly with plastic wrap and store in an airtight container for up to 3 months. We like our coffee cake warm. To reheat: Warm in microwave for 10 second increments until warm. To heat in the oven remove any plastic wrap, then wrap in aluminum foil. Preheat oven to 350 degrees F and heat for 6-8 minutes or until warm. And don’t forget – it’s great for holidays too! Along with our One Hour Cinnamon Rolls and Cinnamon Roll Cake, this Coffee Cake is always on our holiday must-make list. 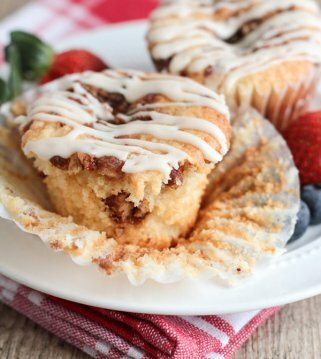 Be sure to try our Coffee Cake Muffins too! Can you tell we love our cinnamon cakes?! The BEST and EASIEST Coffee Cake Recipe! It's moist, delicious and perfect for showers, breakfast and holiday celebrations! In a large mixing bowl. combine oil, eggs, vanilla and milk together. In a medium bowl, blend together sugar, flour, baking powder and salt. Combine egg mixture with flour mixture. Pour half the batter into a lightly greased 9x13 pan. In a medium bowl, prepare streusel by combining brown sugar and cinnamon. Sprinkle half of streusel on top of the batter. Top with remaining batter and then sprinkle the remaining streusel on top. Bake, uncovered at 350 for 25-30 minutes. Thanks for the recipe. That looks scrumptious! I pinned it and I'm totally going to have to try it soon! 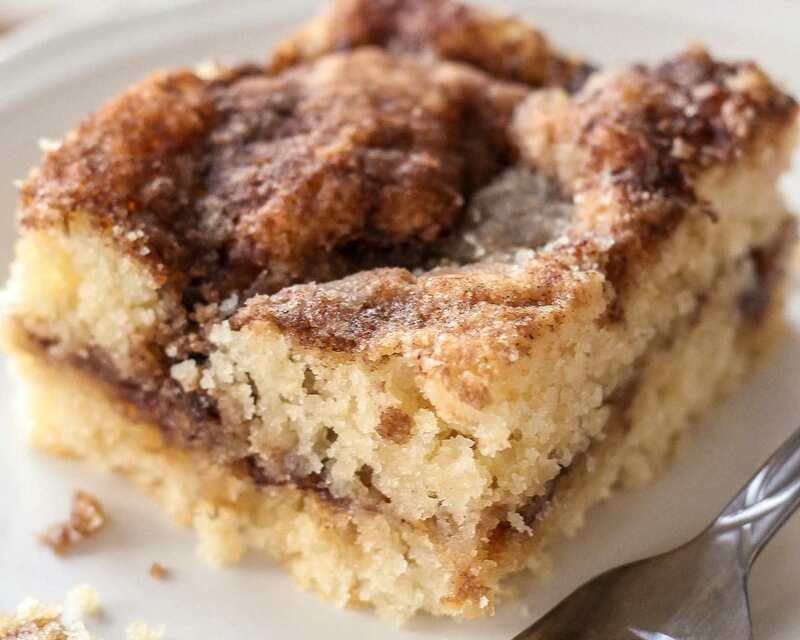 Your coffee cake sounds absolutely delicious! This recipe looks great! I can't wait to try it. Thanks for linking up to Topsy Turvy Tuesday's. I'm featuring this for my treat of the week on the link party today! Because coffee cake is traditionally served with coffee. If I remember correctly, coffee cake was served more as something for guests to nibble on while having coffee with their hosts and not necessarily as a breakfast item, though that’s what it has become. Oh, we love this coffee cake recipe and make it all the time. If you like this you should also check out the cinnamon roll cake – it is so good too! I know that all ovens may vary in baking time, so it may take longer or it could be shorter. I hope it turned out! The middle wasent done so i left it in longer. Very doughie in the middle did I do something wrong ? No, ovens are all different, so some may take longer to cook. Hope it turned out! mINE DID THE SAME THING. I made THis recipe FOR the first TIMe this morning. I pulled Mine from THe Oven 32 minutes After I put it in and It was perfect. Great recipe. I am so glad!! Thank you so much! i was so excited to try this! After preparing it and cooking it for about 30 minutes, the middle sloshed around like jello.. i know other people have had this proBlem aNd i know for certain That my oven Cooks correctly, i think this recipe Should be changed To a high temp or even amount of time in the oven, other than that, it smells delicious and looks even better! Thanks for answering that! I was also wondering why it’s called “coffee cake” but there’s no coffee in it. Now I understand! Thank you! ???? Amazing Coffee Cake, I’m having a piece now with my coffee. My husband loves it and has requested that I make one for him to take to work in the morning. Thank you for sharing your recipes. Can you bake this in a loaf pan? Based on the volume and area, I wouldn’t recommend it. It will have to bake longer (since a loaf pan is deeper) so I would cover it for at least 15 – 20 minutes to make sure it bakes evenly. This may be a silly question, but can you use butter instead? I don’t use margarine at all in cooking because of the hydrogenated oils. I used butter and it was fabulous! Hello. I baked your quick coffee cake for breakfast this morning and it was gorgeous! So quick and easy, too. This will become a regular for me now – can imagine this with blueberries or peaches mixed in. Just wanted to let people know it tastes as great as it looks. It sounds so easy! definitely gonna try. One question only, can I use whole wheat flour? I had the same problem just now when I mixed it up following the recipe exactly. Would love to know if anyone else had this problem. Had this issue as well. Mines in the oven so fingers crossed it turns out. It isn’t a runny batter, so it should be ok! Let us know! Thank you! Oh, thank you so much!! So glad!! I did have that same problem. I also had to bake mine a lot longer. It’s in the oven, I hope it works! How did it turn out? I hope you liked it! After drizzling the melted butter on top of the streusel, I put it in the oven and baked it. When I took it out the butter was just sitting on top and making it really soggy. Was there something I did wrong? How did it turn out Stacey? I hope it did! I’m not sure what is causing the butter to do that. I know that baking times may vary, depending on your dish and oven, so it may need to be in longer. Let me know how it turned out. At 25 minutes that is what mine was like with the butter pooling a little on the top. I added 5 minutes more baking time and at the 30 minute mark it was perfectly fine! Can’t wait to dig in tomorrow! I had the same issue, I poured off extra butter and put back in for more time :::fingers!crossed::: I think I’ll use a wider dish next time. Same thing for me. I sopped up the pool of butter with a paper napkin, baked a bit longer and was fine. Omg I made the coffee cake recipe…divine, it is a keeper! Thank you! It’s definitely a keeper in our book too! So simple and so delicious. 🙂 Thanks for stopping by! Found this recipe on pinterest… Thanks so much! It’s Thanksgiving today and we unexpectedly found ourselves unable to travel to the wonderful dinner waiting at my relative’s house. I was scrambling to at least come up with a special breakfast brunch and this recipe was the perfect addition. It was super fast, easy, and delicious! Not to mention it uses common ingredients that I had on hand… Very important when all the stores are closed! The hubby and kids loved it, thanks again! What kind of oil did you use? Can coconut oil be substituted? It’s a favorite of ours too!! Thanks for stopping by, and Happy New Year! Am I missing something? Where is the coffee in this ‘coffee cake’ Or is it just a cake to have with coffee?? Still sounds delicious but thought I’d ask! I also found that the dough bubbles up in the oven and it becomes uneven. Does anyone else have that problem? In the oven…watch this space. Thanks for the inspiration! Do you prep the 9×13 pan with anything for the Quick Coffee Cake recipe? Could you alter the recipe to state that? I’m just reading the comments while my cake is in the oven (not greased). Are used to Greece everything but I learned my lesson when something didn’t turn out so I always do exactly as the recipes written. It smells great though! Yes, I will 🙂 Hope it came out ok. Thank you! I just made this coffee cake and it is amazing, for the people who do not want a dense cake you have to mix the flour mixture and the egg mixture with a spatula and not an electric mixer. I only used 1 tablespoon of margarine to drizzle on top and it turned out just as great. Thank you, I mixed with a spatula but drizzled all the butter, I will not use all of it next time. Made this tonight for bible study in the morning. Hope it makes it til then! 😉 This is an awesome coffee cake…some can get dry on you, not this one! Delish! Thanks for sharing. Quick question, could I put in pumpkin puree in place of eggs to make it a pumpkin coffee cake? This was the best coffee cake I ever made! I made it for Christmas breakfast and everyone went back for seconds. The only change I made was reduced the melted butter on top to 1/4 cup since it seemed like a lot to me and it was still delicious. 5 star! Made this yesterday for Christmas using 1 cup apple sauce instead of oil & extra cinnamon in the streusel. It took maybe 5 mins longer to cook, but was excellent without the oil! Will become a regular at our house. Thank you! Thanks for sharing the recipe. I tried it today with a little variation. Added chopped walnuts & a tsp of flour to the streusel mixture. I reduced the brown sugar to 1/2 a cup. I used 4 tsp of melted butter instead of margerine. The cake was too good. Hubby liked it too. Must admit that this is one of my best bakes. Thank you so much. Made this but used cocoa instead of cinnamon because I’m allergic to cinnamon. The batter was very thick and the butter is sitting on top of the cake its been 25 mins I’ll leave it in until the butter melts but so far not impressed!!! Sounds like a problem on your end. This batter should be thick. And the butter on top is likely a result of variables in individual ovens and tempts. this was super good! I replaced half the oil with applesauce (other half coconut oil) and it was moist and lovely. I found I didn’t need/use all the strussel — probably have 1/3 cup left over. Thank you for letting me know!! Glad you liked it!! This recipe is consistently delicious! I’ve made it dozens of times, at home, for school, for meetings, for for friends and family, for brunch and for Christmas morning. It’s so easy, so good and is always appreciated. Thanks so much for sharing it! It sure is! That’s why we love it, too! Thanks so much for letting me know that! This was amazing! I used it for a brunch gathering I had this morning, and it really turned out perfectly. I truly couldn’t ask for any better coffee cake! Thank you! That makes me happy to hear!! Thank you for letting me know 🙂 We use this recipe all the time…it’s our fav!! Very good…bakes 10-15 minutes longer for me. This is my newest go-to for breakfast pot lucks and work events. Everyone loves it! Yay!! I’m so glad you found a go-to recipe! 🙂 Thank you! Making this right now! I too have some of the same issues as others…batter is too thick to spread in two layers and the butter is just sitting on the top. Some of it melted in but I had to drain a lot of it off. Baking it for another 15 and I crossing my fingers! Smells delicious! Sorry to hear that. How did it come out? I found this recipe a few months ago and have made it 5 times now ???? The second it’s gone my family asks for another. As soon as I make another everyone wants to come over and take some home. It’s perfect. Not too sweet or heavy. I have been considering replacing the milk with buttermilk. Do you suppose it would change the flavor or texture too much? I dont want to ruin a good thing ???? I love hearing that! Thanks so much! I wish I knew. I haven’t added buttermilk before. I don’t like to ruin a good thing either, so I haven’t substituted ingredients for this. I guess you could try?? Let me know if you do 🙂 Thanks! I would love to make the quick coffee cake recipe, but I try to stay gluten free. Have you ever made it with GF flour? If so, which one? I am so sorry, but I haven’t. Has anyone else? If you bake a lot with it, does it change the recipes ever? If not, I would say, go for it! I made your Quick Coffee cake! The results we’re excellent! My family loves it, it’s easy to make and looks exactly like the picture! Thank you for your recipe! I will be trying a lot more of your recipes. I love hearing that! Thanks so much for letting me know. That’s why we love it, too! I have made 3 of these coffee cakes in the last 2 days, absolute winner and so easy ! Yay!!! We love this recipe!! I love hearing that! Thank you so much!! I didn’t have any milk but really wanted a coffee cake for breakfast so I substituted the equivalent amount of milk with coffee. It’s really good! Definitely going to make it just like this again. There ya go!! Glad you liked it! Thank you so much! I love the Quick Coffee Cake recipe! I’ve made it many times. I do have one suggestion for anyone that the batter turns out too thick. I use 3 eggs instead of 2, makes the batter just right. Thanks Brenda! Hope that helps anyone that has problems with the batter. I made this the other night when I was bored, and my family devoured it so fast we were out the next day. IT IS DELICIOUS and I am already surprising it for my family again!!! Can’t wait to eat this yummy treat again! Awe, I love to hear that!! Thanks so much for letting me know! 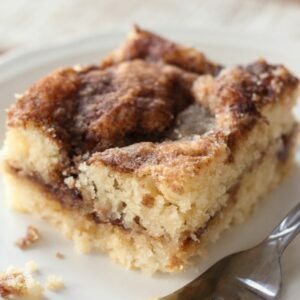 Coffee cake has been a favorite breakfast treat of mine for as long as I can remember, and this quick recipe makes it even easier to make! Thank you so much, I can’t wait to try it out. YUM! Oh, it’s our favorite! I agree with you! Hope you like this recipe! Thank you! 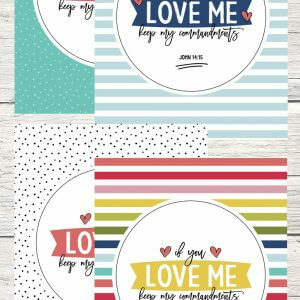 Can’t wait for the Christmas season to roll around, these are perfect for that time of year! Yes, it’s a great Christmas morning recipe!! I combined the brown sugar, cinnamon, and melted butter to make the streusel (I also added a teaspoon of ground ginger). That way the butter is throughout the coffee cake and no risk of the drizzled butter pooling on top. It’s just about to come out of the oven but it looks and smells amazing. It turned out great! I will probably add more ground ginger next time but coworkers loved it! Made it and it was delicious!!! Thanks for the recipe! Do you know how well it freezes if I wanna save a batch to serve later on? You know, I haven’t tried freezing this. I would think it should be ok. We love it so much, that we never have any left, but I should double it & try it myself. Yes, of course 🙂 Hope you like it! I made it and the butter pooled on top and did not cook the middle, I put it in for another 13 minutes with hopes of it being cooked without burning the edges! Oh, no, I’m sorry. I haven’t had that happen..I wonder what made it do that? How did it turn out after cooking longer? I just made this. It is fantastic! Thank You! After 30 minutes in the oven it was not cooked at all. I had to cook mine for 1 hour at 350. Yes, sometimes ovens will vary, but I’m glad it worked out for you! Thanks! I’m making this right now, but it’s taking a lot longer than 30 mins. I keep adding 5 mins at a time. Any thoughts? This was delicious, but I did make two changes. First, I used apple sauce in place of the oil – it came out so moist and delicious and saved me tons of calories! lol And second, for the topping, I mixed the butter (not margarine) with the brown sugar and cinnamon in a small bowl until a bit crumbly but well incorporated and then put that on top of the batter. No pooling of butter on top this way and makes a delicious streusel! Sounds good! Thank you for sharing your changes! Hello Try real butter instead. Every thing is better with butter ! My question: would the reduced sugar make it crumbly? Just wondering and wanting to learn. Thanks for your great recipes! I haven’t tried, so I’m not sure. The only thing that should be crumbly is the streusel. Besides the sugar, you followed the recipe? Recipe is messed up, it calls for margerine, but when you get down to the description, there is no margerine mentioned. Never mind, my ipad didnt load it up until the last second. Made it on the spur of the moment for New Years house guests. Easy to make, got rave reviews. Made my house smell great! Looked a little gooey when I first took out of the oven but nice consistency after it cooled. Followed recipe exactly. Will definitely make again. Thanks!! Oh, I love hearing that! We make this quite a bit! Thanks so much for sharing! Didn’t have a 9×13 so used an 8×8 and so far it’s been in oven 40 min and still when I stick a toothpick in it’s soggy and nowhere near done. Is this because I used a smaller pan? It smells devine though. For sure! Usually recipes take a lot longer in an 8×8, compared to 9×13. How did it turn out? I baked it in a ceramic 9×13 baking dish. It took an extra 20 minutes to get done. Excellent recipe. Next time I’m adding chopped pecans. Delicious! I tried this coffee cake recipe for the first time & my kids & I loved it! They finished the whole pan in one day! Thanks for the recipe! Love it! Thank you so much for letting me know! It doesn’t last long around here, either! I followed the recipe almost exactly (swapped the margarine for butter) and its half way through baking now. I am also seeing a pool of butter forming in the center as the cake rises higher around the edges. Still looks and smells amazing. Hoping it turns out! Woohoo!! I am so glad! Thank you so much for trying it & for letting me know! Would you believe I just pulled one out if the oven! My Mother loved it so much she asked me to make another. I did add 3/4 cup chopped walnuts to the second topping of brown sugar and cinnamon. Since it was still warm from the oven I couldn’t help but think all I needed was a scoop of vanilla ice cream! It’d be great. Thank you again for sharing this wonderful treat. So glad!! That sounds good!! Thanks! Can i sub toom temp butter in thr batter instead of oil? I really like your recipes! Hi! I made this yesterday to share at bible class. IT was so delicious and easy!! Everyone loved it. Mine cooked for 40 minutes. I followed everything else exactly. Thank you!! Wonderful!! I am happy everyone loved it! Thank you for trying it! Turned out good, but a little crumbly. I had to cook about 15 extra minutes. It can be messy 🙂 Thanks for giving it a try! I just made this for my kids for breakfast. It was very good and they loved it. I’m starting a blog where I make recipes I find from blogs and I write about them. I will absolutely be writibg about this one! I’m glad they liked it!! Thank you! Do you prefer to use cake and pastry flour or all purpose flour for your Quick Coffee Cake? Looks fantastic! I just use all purpose flour 🙂 This is our favorite!! I hope you like it! I did something wrong! Aaaa! My husbands hopes were so high. I blended the eggs with the liquids. Would that make it watery? I also put the 1 1/2 brown sugar in with the white sugar mix. Then added more for the strudel. Could that be it? The eggs were super fresh from my chickens. Could that be it? I’m obviously not a cook. Thanks for the recipe even though I messed it up. I’ll try again another day. The only thing I notice is that you mixed brown sugar with the white sugar. The brown sugar is for the streusel, it’s not in the cake. You did the eggs right with the liquids. That could have been it with the brown sugar. I hope you will try again 🙂 Thank you! Made this for Sunday brunch with friends and everyone raved about it… it was quick and easy and delicious. I added chopped walnuts to my filling just because I like nuts in coffee cake, but it would have been great without too! thank you! I’m so happy to hear that it was a hit!! Adding nuts is a great option. Thank you for letting me know! Do you grease and flour the pan? Yes, sorry. I do lightly grease the pan. You don’t have to flour it, but you could 🙂 Let me know what you think! This cake batter gave me some issues at first. The cake had to much butter floating on the top. when i took it out of the pan, it was so soggy it fell apart. I tried again and it worked! i have no idea what went wrong the first time! This is perfect and my new go-to recipe. So easy to make with ingredients I always have on hand. Thank you! That makes me so happy to hear! Thank you for letting me know! Just made my second one. What I like about this is it doesn’t require sour cream. Not that I have anything against sour cream, but I never seem to have it on hand when I crave coffee cake, and in fact baked this because it was the only recipe the didn’t require it when I went looking. Two notes: Yeah, the batter is thick. I just slurped in more milk until it looked right. Worked for me. And 2: the filling/topping allows for a lot of variation. For instance, I divided it this last time and added a big pinch of cocoa powder and some chopped pecans to the filling, and some shredded coconut to the topping. All stuff I had in the freezer and fancies it up a bit and makes it that much better. Thank you so much for sharing that! I am so glad you came across this recipe, as well!! We live in Canada. 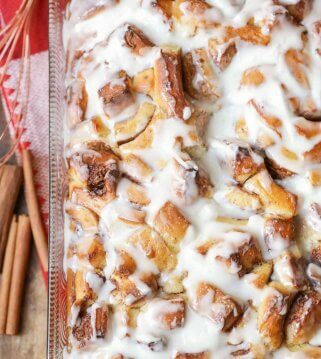 I would love to make the cinnamon roll bake but I’ve never even heard of frozen pre-made cin buns. We only really have the Pillsbury ones that come in 8’s or 5’s and it says right on the package not to freeze them. Can you tell me or post a picture of the ones you use please? I pretty much followed the recipe and it turned out great. I didn’t have trouble with the batter being too thick since I just made sure I “poured” it evenly so I didn’t have to even it out much. I didn’t use all of the brown-sugar-cinnamon mixture because I was afraid it might turn out too sweet, but next time I will use all of it, so the listed amount seems just right! I also didn’t pour any margarine on top and it still turned out great. Yay!! Glad you liked it 🙂 Thank you so much for sharing! I made this today and it was gobbled down, this is a sure keeper, Thanks all the way from Israel. I am so glad to hear that!! Thank you so much for trying it & for letting me know! I would give this’s 5 stars other than the fact that the batter was hard to work with! My pan didn’t have the dimensions on it but it looked like 9×13. I poured what looked like half the batter in and it just didn’t reach all sides. I poured in more and then the topping and hardly had enough for a second layer! Took forever to bake and the topping just sat there instead of dissolving and getting all yummy. Still tasted great, but it was just frustrating! Thank you for giving it a try! I am sorry it was difficult. I am glad you liked the taste, though! I have been looking for a Coffee Cake recipe like the Drakes Coffee Cakes that I grow up on. I finally found it. I used half of the sugar both in the cake battered the streusel, and half of the margarine on top, and I only put the streusel on the top of the cake. It came out perfect. Thank you for the recipe. I’m looking forward to trying some more of your recipes. Thank you!! I love that you are trying some! Hope you like the ones you try! I have made this a few times to take to work and it is now a permanent recipe in my collection. It is easy to make and simply delicious! My coworkers request it on a regular basis. I have also added chopped pecans to the streusel mixture, along with some cinnamon chips mixed into the batter. Both were wonderful additions, but the original recipe is just as good. 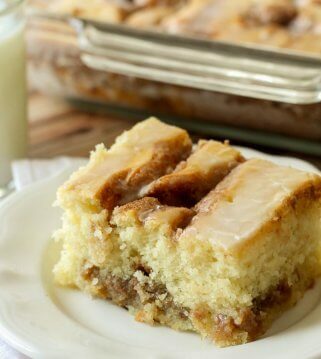 Do yourself a favor and try this delicious coffee cake! Thank you so much for sharing that!! I love to hear this & love that you share it! What type of oil is used in this recipe? I used vegetable oil 🙂 Enjoy! Can this be converted to gluten free? Sure could 🙂 Let me know what you think & do. Thank you! It turned out pretty good. I made it for my sister in law last night and today it was really tasty. I used Pillsbury gluten free flour, half oil-half applesauce, and everything else was the same. This was my first time baking anything gluten free. She said it was really good and that she couldn’t tell it was gluten free. Need a recipe for coffee cake that’s easy/fast w/no special ingreds & found this one. Unsure if I’ll get a reply bcuz it’s an older recipe but I have a question question. Step 1 says “combine” ingreds which contain liquid. Step 2 says “blend” but only contains dry ingreds. The dry/wet ingreds don’t come together till step 3. I typically think blend means “use a mixer” but unsure here. I’d like to make this asap. Do I need elec mixer or just stir to combine? Thanks! You can use a mixer or use a spatula. Either works 🙂 I’d love to know what you think! Hope you like it! I take breakfast to my grandkids every morning in small rubbermaid dishes so they can eat in the van on the way to school. I’m always looking for something different that can be easily eaten in the van. I made your coffee cake recipe this morning and they loved it. In fact, my 11 year old granddaughter declared it to be her new favorite food. My son and husband love it too. Thanks! I have to admit something though. I’m lazy. I use my stand mixer and first beat the eggs, then added the rest of the wet ingredients, then the dry ones one at a time, ending with the flour. Saves one dirty bowl, and the resulting batter was silky smooth. If there is a reason the mix the wet and dry separately, I can’t figure out what it is. Love it! I am glad they all love it!! It is our go-to recipe for sure!! Thank you for sharing! I used butter instead of oil and creamed it with the sugar and before adding eggs, milk and vanilla. I also used rounded teaspoons of cinnamon instead of leveling off. I added 10 minutes to the baking time – so 40 min. It sure smells divine and I can’t wait to have a piece later this evening..
It’s the best smell! Thank you for trying it! Is there a milk substitute for your quick coffee cake if I want it to be dairy-free? I have not tried these, but here are some suggestions I found online…Here is a guide to help you choose the right non-dairy milk for all your cooking and baking needs. I used sugar free almond milk instead of regular whole milk. It was great. I made the quick coffee cake, and it was delicious. The batter was thick, and I questioned it at the time. However, it turned out great. I was wondering if this recipe would work if it was put together the night before, and baked in the morning. It should be ok 🙂 I haven’t made it the night before, but don’t see why it couldn’t be. Thank you so much for letting me know. I am so glad you liked it! Hi when I saw your quick coffee cake recipe I knew I would try it and take to a ladies get together where it would suit all tastes. It’s truly easy to make and I love it. It’s definitely a favorite recipe. Thank you for sharing it with us. Awe, thank you so much for letting me know!! That is why I love it too! Coffee cake still oozing and gooey (uncooked) even after 35+ minutes. The butter keeps it soggy and doesn’t allow it to cook. Cook through. How did it turn out? I know all ovens vary, so baking time could be different. Hope it turned out! I’m HAving the same ISSue. I’m a bit OVEr the hour mark in the oven and the entire center is still a WEt Doughy mess. I think I’ll try it again and just make normal streussel by adding my Butter DIREctly to the brown sugar CInnamon mix. I Understand OVens vary, but I THink ITs happening because tHe BATTEr Is play dough thick ANd isn’t allowing THe LArge AMOunt Of BUTTer to absorb properly. Hopefully my sECond attempt WILl WOrk out better. I made this recipe yesterday and put in 2 round cake pans. I sent one to my daughter and my phone has been ringing all day with compliments on this coffee cake. It is awesome and so moist that i have to moan with each bite. Definately a keeper. I love hearing that!! I am so glad you both liked it! Thank you! Can we use olive oil? I had the same problem with the butter. The center was not done. Put it in for longer and was still squishy. Had a great flavor, family loved it. Will try again, with less butter. This recipe is delicious, I’ve already made it once before and I’m making it again this weekend. I just wanted to ask if the batter or the topping could be made ahead of time (as in a day and a half before) or would that not be good? I personally haven’t made it that far in advance. I’m thinking it should be ok 🙂 I’m glad you like it! Are you sure that it’s a cup of oil? Sure sound like a lot of liquid for only 3 cups of flour. Yes 🙂 I promise it all comes together & is really good! Is it all-purpose flour or self-rising? Also! We have the same first name spelled the same way! This is the first time I’ve seen it the exact same way as my own. This cake was meant to be!! ???? Oh my god this is SO good!! Great recipe, but do i have to grease pan? Didn’t mention that, but I like to a little 🙂 I hope you like it! How many does this recipe serve? I have a brunch for 40 coming up and will need to scale it up. You would need to double it or even triple it. Depending on how big you cut them, you could get maybe 15-20 pieces in a 9×13. It is always a hit!! Good luck! I’m going to make it with my gluten free flour blend and triple the recipe. Let me know what you think! 🙂 Hope you like it! I used gluten free flour and it was so delicious! I tripled it and it was the right amount for 40 people. Yay!! I am so glad 🙂 Thank you for letting me know! Is it supposed to turn out crumbly :/ I feel like I did something wrong somewhere. It definitely doesn’t look like the picture. Not too crumbly. I am sorry, I wish I knew what happened. All the measurements were correct? Yes, I also used evoo and baking flour. Could that have something to do with it? I really liked the coffee cake. So did my husband! The batter was thick. I assume it is supposed to be but the top layer was too thick to spread without messing up the streusel. It looked clumpy instead of a smooth layer. Is that the way it should be? I am glad you both liked it. It is a little thick, so you may not have done anything wrong. Was it ok, after baking? You should be able to spread it around. Can Almond Milk be used instead of milk? I haven’t tried, but I am sure it could 🙂 Let me know what you think! Please tell me the calorie count for quick coffee cake is a misprint! 4721 per serving? I made the cake for company and everyone loved the dish. When I went to make it again I looked at the calories, and couldn’t, in good conscience, bring myself to bake the cake again. Lovely cake! Make sure to use a relatively flat pan and swirl the streusel about! There’s a recipe for blueberry coffee cake: 1c oil,2eggs,1t vanilla,1c milk,1c sugar,3cflour,3t baking powder,Half t salt,1.5c brown sugar 2t cinn, Half cup margaine 9/12 in.pan. pour in pan half and half of mixture ,half topping, half stussel. Drizzle w butter. HOW MANY CUPS OF BLUBERRIES(FRZ)???? I love this coffee cake and have made it at least 4 times already. I would like to change it up and make an apple coffee cake with similar ingredients. Should I add less milk or oil to balance out the moisture? Or should I just add in the apples with the recipe as-is? Thank you for sharing that!! I hadn’t tried adding apples, so I was unsure. I am glad it turned out! Ate the nutrition facts for Quick Coffee Cake for teal. Would love to make it but not if they’re accurate. In the nutrition facts, the numbers seem a little high. Was that a mistake and if not do you know how I could make it lower in calories ? Yeah, 4000+ cal per serving can’t be right. This is so easy! It has become my Daughter’s most requested recipe from me! It’s great for breakfast or dessert. Making this tonight, for tomorrow the Daughter is getting braces. It’s soft and she’ll be able to eat it no problem! Thank so much for this!! Thank you so much for sharing that! We love it any time of the day, too! For step 3, do I add the wet into the dry, or the dry into the wet? It doesn’t matter. I would add to whichever is in a bigger bowl. So, if your dry ingredients are in the bigger bowl, add you wet to that. Let me know what you think 🙂 Thanks & enjoy! This recipe was absolutely amazing! There’s only one slice left, even though I made it yesterday! My sister loved-and she’s been waging war on any sort of carb. This was delicious! Yay!! Love hearing that! Thank you so much!! And, yes, it goes fast! Thanks so much for the recipes my nephew came across your page he as soon as he did he jump in his car to come and show me all the new recipes. He said he will go to the grocery store and pick up some of the ingredients he don’t know where he want me to start but he ready to eat I told him silly boy go do what you got to do and I have to say that the recipe look delicious once again thanks and keep them coming. I love this!!! That is so awesome to hear that he found some recipes for you to try 🙂 Well, I hope you try some & like the ones you do! This recipe is so yummy! I left everything the same except the butter for the top. I did 1/4 cup instead of the recommended 1/2 cup and it was perfect. I baked mine for 35 minutes. This will be a regular dish for church, friends, family and pot lucks at work. Yay, I am so glad to hear that!! It is the best recipe to take anywhere 🙂 Thank you for letting me know! This was the best cofffee cake ever! I added chopped pecans to the brown sugar mix and it was so good! I am so glad you think so!! Thank you for letting me know! This is super easy to make and it’s delicious! I just made the easy coffe cake this afternoon and it’s delicious! Yay!! Glad you liked it! Thank you! This was the tastiest & easiest recipe ever!! I made it for breakfast, but it could easily be dessert, too! My family has requested it again! My sister has a yummy coffee cake recipe but I never make it because there are so many steps. I really loved how simple this one was to make and it tasted just as good. Yay!! It’s great for brunch!! We all loved this Coffee Cake. 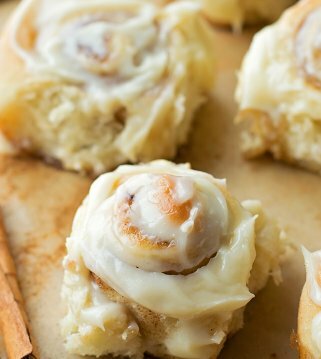 The cinnamon is bursting in this recipe! I made it while guests where in town, and it was perfect. Quick and delicious. Thank you for the new go to recipe for when we have guests! THIS is the best and easiest coffee cake I have ever made. It is so simple! I was a little nervous about putting all the melted butter on during the final step but it made the edges so nice and crispy. This recipe is a keeper and I’m glad I found your site while searching on Google. Yay!! Love to hear that! I am glad you found it 🙂 Thank you so much!! Cooked for over 40 mins and it was srill soggy. While my whole family agreed this recipe was delicious, everyone felt sick after just one brownie-sized piece. If you struggle with intensely sweet things for breakfast, I’d recommend halving the brown sugar, butter and slightly reducing the oil and white sugar. Absolutely a delicious coffee cake, but this is more dessert than breakfast. Thanks so much for trying it. I am glad your family likes it 🙂 Thanks again! Thank you so much for leaving a comment 🙂 I appreciate it! Yes, you can add all kinds of things, that’s what I love! Thank you for trying it & letting me know! WOW!! Thank you so much for leaving a review 🙂 I am so glad you liked it & I’ll have to try adding apples! Thank you for trying it. Yes, all cooking times will vary, depending on ovens, but I am glad you liked the taste! Not enough batter for a 9×13. Used an 8×8 and then had to Bake it for an hour. Not the kind of coffee cake i was expected. Lacked flavor but it was edible. So easy!!! My kitchen smells like Christmas!!! Thank you!!! Best smell ever!! Thank you so much!! For the people who comment that it has no coffee in the coffee cake that’s because coffee cake was originally made to be eaten with your coffee. It does not traditionally have any coffee in it. I have made this recipe many many times it is so awesome. easy and super tasty. ober and novemberi make this great recipe. Oh, thank you for saying that!! It is super easy & one of our favorites! I just need to clarify: You mix the butter with the Brown sugar and cinnamon? 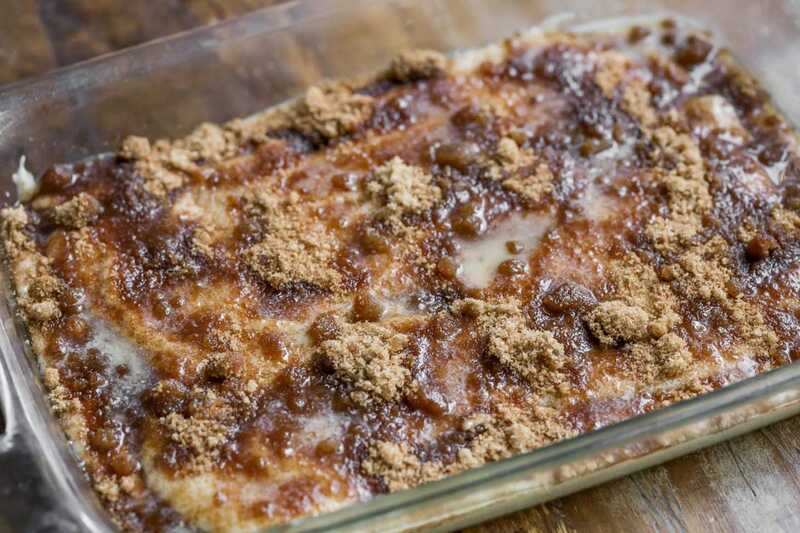 4) In a medium bowl, prepare streusel by combining brown sugar and cinnamon. 5) Sprinkle half of streusel on top of the batter. Top with remaining batter and then sprinkle the remaining streusel on top. No, you sprinkle half the streusel on top of half the batter, then pour remaining batter on top, then sprinkle the rest of the streusel & drizzle melted butter over the top. Hope that makes sense 🙂 Hope you like it! Followed recipe to the T but took it out of the oven after 30 minutes sides were burnt and middle was a gooball. It’s absolutely perfect!!! Besides being DELICIOUS, it’s also foolproof. Thank you so much for sharing that!! I made This cake this morning and let Me start off by saying that my entire house smelled so delicious. Had a piece after it cooled Down a bit and OMG, it was scrumptious! I will definitely store this recipe in a safe place and use it FOr years to come. Thank you for sharing your recipe. You are so welcome!! I am so glad you liked it!! Thank you for letting me know! Yay!! I am glad it did! Thank you! This was so easy to make. Everyone loves it. This will be my new coffee cake recipe from now on. Yay!! Love to hear that! Thank you so much! I was wondering if this could be made the night before and baked the next morning? I have not tried, but it should be ok. I hope you like it!! Can I use sOy milk in this recipe? I personally haven’t tried. It will probably change it a bit, but can’t tell you exactly, since I have not tried. WHat are the adjustments for high altitude baKing for This easy coffee cake? i am at 9,000 ft.
How is This A coffee cake with out any coffee? Made this for the first time last year and everyone loved it. My oldest son, 33, asked for it as a Christmas present lol. So yes that was one of his presents! Now making for Thanksgiving! LOL!! That’s awesome! Thank you so much! All 3 of my adult “kids” decided to Come home and spend the night. As I wondered what to make for breakfast the next morning, I found this RECIPE. I had all the ingredients on hand and decided to give it a shot! I Cut the melted butter down to 1/4 cup and drizzled the cake with powdered sugar icing. Very moist. Easy, and delicious! Oh, I bet that was a fun treat to have them home! Thank you for trying this!! I am so glad you liked it! Made this for ThaNksgiviNg morning. It was amazIng!!! Had to nearly double the baking tIme, And i Ended up wrappiNg Wet dishcloths Around the pan so the sides didn’t overcook. So, glad you liked it! This is one of our favorites! Thank you so much! Truly the best coffee cake you can make. So simple and easy to make. You’ll never want to try another recipe! Awe, thank you so much for saying that!! That’s so nice! I am glad you do! I LOVE IT. I’m totally going to have to try it soon! THis came TOGETHER quickly with staple items i had in my pantry and the texture and flavor is pure perfection. DElicious and tastes like a bakery product. I am so glad to hear that!! Thank you so much for letting me know! So I made this this morning. I saw all the comments about how thick the batter was and how the butter pooled on top. All true. I had my reservations. baked it for 30 minutes until it was browning around the edges. The streusel on top isn’t like your typical crumb topping – so it’s not as pretty. I was surprised how much it rose, no doubt due to the three tsp baking powder. And I like the cinnamon sugar in the cake itself. Decided to try a piece while it was warm. Then another. Then a third. Yeah, this is a tasty cake – nice and light and not too sweet. i’ll try to save the rest for breakfasts. thanks. Yay! I am glad to hear that! Thank you so much for letting me know! Hi there, about to make the cake, but I’m confused. Do I put 1 2/2 cups sugar in the batter? Then how much more sugar do I use for the streudal topping? Thanks! Maybe I am doing something wrong, but the amount of batter is not enough for a 9×13 pan. It’s a thick batter too, so spreading it on top of the streusel layer is quite challenging. Will need to make another bowl of batter. It should be enough. Yes, it is a little thicker, so it’s ok to have the streusel not completely covering the layer. I hope it works out. Thank you so much! I hope it does! This is a favorite at our house! It’s so simple, but oh so tasty. We love it with scrambled eggs and a smoothie. Yum! Totally making this for Christmas morning! Yay!! Hope it’s a hit! So delicious! 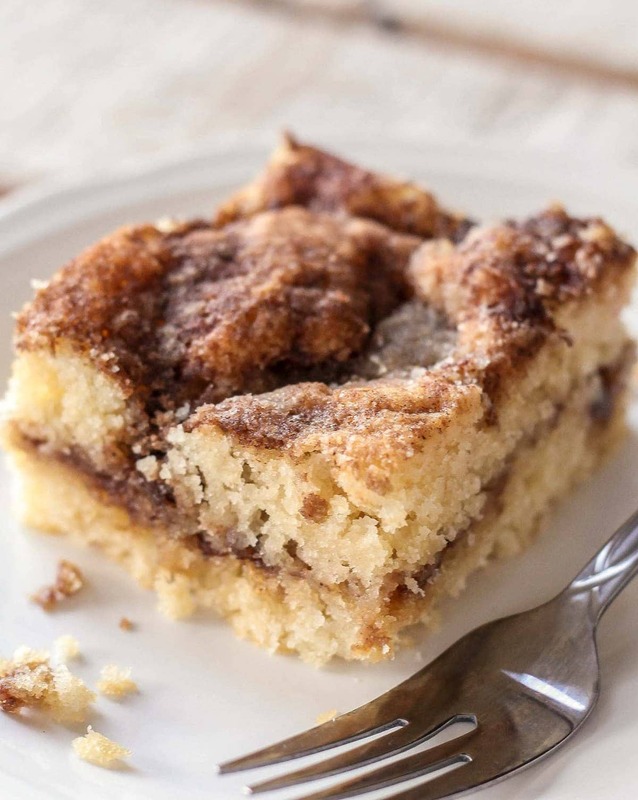 Coffee cake is one of favorites – and this one with the cinnamon swirl is definitely a keeper! Great recipe, Thanks and God speed. I’ve made it twiCE AND IT TURNED OUT GREAT BOTH TIMES! I WOULD DEFINITELY PLAN ON BAKING IT FOR, AT LEAST, ANOTHER 10 MINUTES. I agree….I put it in for the full 30 and it was still too runny! What cOnsistency shoUld The batter be? I followed the recipe exactly and it seems to have come out too thick. I used the right meThod to measure The flour. This Coffee cake looks so good! i can’t wait to try it! Yay!! I’m glad 🙂 Thank you so much! I have baked for the full 30 minutes and the batter still is very wet. I don’t know what I’m doing wrong. I think it is from all the butter drizzled on top. What should I do???? I am sorry 🙁 How did it turn out? It’s ok, if it’s longer than the recipe, since all ovens are different, baking times could be different too. Thank you for sharing that 🙂 I sure hope it’s a hit. Let me know! Im prett sure i’ve dOne something wrong. I followed the recipe Exactly. The batter Was really sTicky and thick. It is still in the oven and wet in the middle After 45min so far. Is 1cup oil correct? It is correct. It’s ok, if it’s in there longer. Let me know how it turns out! Hi, thanks for the recipe. 🙂 It turned out pretty nice. I halved it and used a 9×9 pan at 350F. cake is nice and moist but baked after 27 mins. I just wanted to write in for others to know that an alternate way to make the streusel is to add in some flour to the dry mix. and then mix in softened butter until it is coarsely mixed (but not dough). my streusel topping is too crunchy/flat for me and a bit too sweet. You can also add a little salt. i think i will use this recipe but try the streusel that way next time to try to get it more crumbly. Using melted butter this way might work better if you put it into the streusel mix before topping? not sure. I am glad it turned out 🙂 Thank you for sharing that! Are the amounts in this recipe off? I just made this and there wasnt enough batter to deVide in half. So, i placed all of it on the bottom ans the streu on top. Currently baking ans i hope it turns out well, just a bummer that iT didnt work out as you posted. No, they are correct 🙂 It should be enough to at least cover the bottom. It doesn’t have to be a lot. I hope it turned out! Made This coffeecake over the holidays and everyone loved it, even people who need chocolate chips in everthing said this was a keeper! LOL.. I love to hear that!! Thank you so much! Very easy to make, impressed my in-laws, one of whom has a sweet tooth while the other prefers less sugar. This cake was/is perfect and so simple to make. I didn’t have margarine so used butter instead. Oh, that makes me happy to hear..that is please everyone 🙂 Thank you for letting me know! My favorite coffee cake recipe! I love the buttery, brown sugar taSte of this cake. Its just one of the best. This didnt really work out for me and i dont know why! I followed everything to a T but the margerine pooled in the center while bakIng and it took over an hour to get it baked enough to consume:( you bet i Ate it anyways and it tasted amazing, ill have to try this one again with less margerine i think. You could definitely try less & see. I am glad you still liked it! I love this coffee cake!! We made it over the holidays & it turned out so soft & had the perfect amount of cinnamon flavor..it was a hit! The way to my heart is breakfast pastries. This was one of the best coffee cakes I’ve had! Coffee Cake is one of my favorite desserts/breakfast!!! Can’t wait to make this one! One of mine too!! I sure hope you like it! Oh how i wish i had a slice of this coffee cake! Looks so good. Wow this is yummy! We all loved it! This looks incredibly delicious! This couldn’t look any more perfect! My mom always called this breakfast cake and i was always excited to wake up and find it waiting. Your recipe rivals hers and Is a new favorite. This coffee cake is so amazing!!! My family loved it! Turned out amazing!! Everyone loved it! Gonna try the cinnamon roll cake next! Thank you! Yay!! Glad to hear! Thank you so much!! Has a lot of potential, but i gotta agree with the posters who had wet or liquid cakes. I recognize that every oven is different, but mine is pretty true to temp and i never really have to adjust temps or times for other recipes. Unfortunately this managed to come out with a wet to squishy middle and a very burnt top, even after turning the temp down when i saw the direction the cake was heading. Probably needs more time at lower temp for most ovens, cinnamon in the batter to add mlre flavor, and a brown/white sugar mix for the topping. Just made this and it was a hit with my family. I just added 5 minutes to the baking time based on some reviews. Looking forward to making this again for my coworkers. I am so happy to hear that! Thank you for sharing that! Would this recipe work to Prepare aHead of time and refrigerate before baking? This looks so moist and Delicious! My daughter saw the video and wants to make it! I can’t wait to try it! I love your recipes! Found this recipe by googling “easy coffee cake,” as I’m not much of a baker, but am sick of the supermarket’s substandard bakery offerings. I loved how this only required ingredients I already had on hand, and I didn’t have to break out the mixer or do anything fancy. Like many other posters, I found I had to cook this a little longer to get done in the center (I took mine out at 31 minutes, and it maybe could have gone a minute or two longer). Definitely a keeper of a recipe; I’m going to try some of the fruit versions i see in the comments–this seems infinitely adaptable. I also love that your mother made this for you when you came back from summer camp–what a lovely and loving thing to do. I also love how patient and kind you are with comments asking about something you’ve already covered in your original blog post. Thank you (and my husband thanks you) for this great recipe! I am so glad you found it & tried it!! Thank you so much for sharing that. Glad you like it! My kids and I just made this!! It is sooooo good and moist. We did have to cook it about 30-35 mins but we have a gas stove so maybe that makes a difference. I just kept checking it with a knife in the center. Love this recipe ? Absolutely delicious, easy and had everything on hand! While making the recipe I wasn’t paying attention and used a loaf pan by accident instead of a 9×13. Needless to say, I found myself questioning the amount of butter used for “drizzling” as it was more like a butter lake. As if that wasn’t enough to double check the recipe, I looked in on my coffee cake at the 25 and 30 min mark and it was still well under done. Once my brain finally kicked in I vaguely remembered seeing “9×13” at some point and re-read the recipe. Oops! I scooped out a lot of my butter lake realizing the drizzle for a 9×13 isn’t quite what one needs for a loaf pan. 1 hour into cooking it still wasn’t set. I covered the top with foil since the streusel was on the verge of burning and another 15-20 mins later it was ready. After a short semi-cooling period both in the pan and out of the pan my husband and I thoroughly enjoyed this! Like for real, it’s great. I will never look for another coffee cake recipe. My husband and I ate our cake with coffee, as you do, and I’m thinking back at my snafus…maybe I should have had some coffee before making the recipe as well. 😉 Bottom line: if you accidentally (or purposely) use a loaf pan, you won’t be disappointed. It’s amazing. Just recommend using (at most) half the butter, keep an eye on your topping in the oven and don’t expect to eat it anytime soon. Thanks for the recipe Lil’ Luna! LOL…well, that is good to know! I am so glad you both liked it!! Thank you so much for sharing that! Loved it! easy to make and so delicious. Thank you for sharing that! Glad you liked it! This recipe called for one cup butter, but then did not explain how to use it. Was it for the crumb topping or for the batter??? I just skipped it entirely, left out all the sugar and brown sugar and added by own custom ingredients, like honey, coffee syrup, oat bran and walnuts. yikes! what a fine outcome it was !!! truly a real coffee cake. light and healthy, with little sweetener. I’m another kitchen dweller, but six kids! Oh my i can only imagine! Enjoy your posts! It can be crazy, but fun 🙂 Thank you so much!! This coffee cake was delicious. It was a bit thick to pour half batter into pan, top, then add the second day half- but it Came out moist and scruptious. Will make again. THANKS! i wanted to post my EXPERIENCE with this recipe since at first I didn’t think it would work. Once the dough was mixed it was very thick. So thick that i was convinced i hadn’t added the milk but when i looked at the measuring cup i saw milk so I confirmed i had. the recipe said “pour the dough” but i had to spread it with a spoon. it was so thick that i could not spread it well in a larger pan, so i used a 9×9″. also i was out of cinnamon so i used apple pie spice. due to smaller size pan i did not use all the streusal topping but poured all the melted butter on top. it appeared to be pooling as some readers commented but i put it in the oven and expected poor results. amazing! it turned out perfectly. i was taking it to a meeting and the people loved it. my reason for posting is to reassure anyone who has the same EXPERIENCES that mine turned out great. i would DESCRIBE this as a “dump cake” recipe — very easy and the flavors and textures are good. Thank you so much for sharing that, Janet!! Apple pie spice sounds good! I am so glad it turned out! I’m the chief cook, baker and dishwas in the home. I’m alwaYs looking for new things to make. Found this recipe and it was so good i made it twice in a row. But i get bored easily so then made a differenT coffee cake. #3 is just getting done in the oven now. Sorry! Something strange is going on when i Typed my comment. Of course i meant to type “dishwasher” and i have no explanation for the rogue capitalizations. One other thing: I also added some chopped nuts (about 1/2 cup?) and about a tablespoon of flour to the cinnamon mixture. I also added more cinnamon than in the recipe because like cheese and garlic, who measures? LOL!! Love to hear that!! Thank you for sharing what you did 🙂 Glad she likes it! agree with others that the batter was very thick. “Spread” would be a better description of what you have to do to get it in the pan! 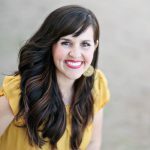 BUT… This Recipe really saved me in a pinch when my husband told me on sunday morning we needed to take breakfast with us to share with our sunday school class. mine turned out just like the picture which is rare. in the future, i would make sure to use unsalted butter on top because i thought it was really salty. no one else seemed to mind and it got eaten right up! This turned out so well!! I’ve made this recipe twice now and my cake has turned out perfect each time. thank you so much!!!!!!! I love to hear that!! Thank you! Made this recipe for famIly and friends over the weekend. Everyone loved it and asked for the recipe. Thanks for posting sUch a delicious cake recipe that is very easy to make! Flour 🙂 Thank you so much!! I’M ATTEMPTING THIS RECIPE NOW IN A GLUTEN FREE VERSION…. MY BATTER WAS MORE DOUGHY THEN IT SHOULD BE BUT I’M HOPING THE TASTE FACTOR COMES THROUGH…. I’VE MADE THIS VERSION NON GLUTEN FREE AND IT TURNED OUT AMAZING…. I sure hope it does! Let me know! I’ve been on a health challenge for five weeks and today is my “cheat day.” This recipe is what I “cheated” with!! In fact, I’m having my second piece right now with a cup of coffee. I had no problems with the batter at all. My family agrees: this recipe made it to the “make-again” category. Yay!! That makes me so happy to hear! It’s a good recipe for cheat day! Thank you! Great idea!! I will have to try 🙂 Thank you! This is easy to make with ingredients easily available. A winner! Fabulous! It tastes just like the coffee cake my Mom used to make!! I have a gas oven and needed to bake it for 42 minutes. Thanks so much for bringing me back to wonderful memories growing up! I am glad I could 🙂 Thank you for letting me know! This is one if the best coffeecake recipes i’ve ever made. Fast, easy, and absolutely delicious. My husband went nuts over it, said i can make this one anytimE. Thank you for sharing. I am so glad to share!! Thank you so much for letting me know! i MADE THIS YESTERDAY FOR AN OCCASION AND GOT NOTHING BUT COMPLIMENTS, WILL DEFINITELY PIN THIS. i USED A BIT LESS SUGAR AND PUT CHERRY PIE FILLING IN THE MIDDLE. yUM. This recipe is messed up! I knew a cup of oil had to be wrong. That’s way too much oil, and i couldnt get the batter to bake, even after 35 minutes. Also, there’s not enough batter to spread two layers in a 9×13 pan. Great Concept, but you need to change the oil and suze of pan. Not sure why your cake didn’t bake right But I used a Cup of oil and it was fine. it was a little difficult getting the better to spread across the pan however I was able to do it and it’s big fine. SorrY my last reply had some incorrect words in it. Meant to say: Not sure why your cake didn’t bake right. But I used a Cup of oil and it was fine. it was a little difficult getting the batter to spread across the pan however I was able to do it and it’s baked fine. Excellent! everyone loved it. I also accidentally put in an extra 1/4 cup sugar and it was still great. This turned out delicious! It was crisp and crumbly on the outside and soft and fluffy on the inside. My only problem was that I am a child and fairly inexperienced in baking, so when I saw oil I was not really sure what kind of oil to use. Canola oil worked well, but I think it would be a good idea to state specifically what kind of oil. Oh, and I used brown sugar instead of white sugar. anyway, it turned out great! Thank you! I am so glad you liked it & tried it! Usually, when you see the word oil, it’s vegetable oil, unless otherwise stated 🙂 But, I am glad you improvised! How much honey shall i use if I use honey as a substitute to sugar? and does that make the cake softer or something? I personally have not tried. I plan on making one and take it to work when it is my turn to bring friday breakfast treats. however i don’t have time in the morning. can i bake it the night before and warm it up in the microwave at work? should i back it in the oven to 90% done so it won’t become hard when i warm it up? what is the best way to go about it? It should be ok to bake all the way, then heat up. Sometimes, I cover with a paper towel..it helps to keep soft. This is the best coffee cake ever! Everyone loves it and it is so easy to make! I am so glad you think so!! Thank you so much! Thank you for trying it & for letting me know! I am so glad he liked it!! This Is a delicious recipe. We added about 1 cup of pecans to the topping to add Some crunch and nutty flavor. Perfect!! Thank you for sharing that! I wonder if this could be made ahead and kept in the fridge to pop in the oven in the morning. It should be ok 🙂 I personally haven’t tried, but I am thinking it should be good!